One of the best-loved pieces of Pilots memorabilia is a group of paintings created by famed portrait artist, John Wheeldon. This series of eight, 8.5" X 11" prints were originally created as a promotional item to be given away at Pilots games. However, it quickly became apparent that more had been ordered than could be reasonably given away. The team was loathe to house a huge inventory of the prints, so they started selling them for 25 cents apiece at Sick's Stadium concession stands. Although the prints say, "Wheeldon's Pilot portraits are commissioned exclusively by the Seattle Pilots," the Pilots weren't the only team for which Wheeldon did the paintings. None of the former Pilots officials I've talked with remember much about the prints, but in April 2001, I tracked down Wheeldon's eldest daughter, Joan, and she was able to fill in some details. Q: Besides the Pilots, I've confirmed that your father did paintings for the Red Sox, Mets and Twins. Do you know if he created them for all of the major league teams? A: Just for a selective few, not all the teams. In addition to the ones you mention, he also did a set for the Angels--that's the only set I've kept. You might be interested to know that he didn't get paid for most of the baseball prints. He did business with a man down on Moorpark in Los Angeles and was supposed to get paid a percentage, but the man never came up with the money my father was owed. Gene Autry made sure he got paid for the Angels set, though. Gene was around the house all the time. A: My father did a lot of work for him, including album covers and the murals for Gene's hotel in Palm Springs. Q: How long did it take him to finish one of the baseball paintings? A: He didn't work straight through on one, he'd have a whole series going at a time. Altogether, he probably spent a couple weeks on each. He was especially proud of the hands. He did terrific hands and most artists don't do them well. Q: Was your father a baseball fan? A: I remember he used to take me to Boston Braves games, but he loved football more. The 49ers were his favorite team. Q: Is there anything else you'd like to add? A: Yes, the players' faces from these paintings were also put on a set of mugs. I don't remember which teams, though. I've yet to see one of the mugs Joan mentioned, but since the portraits were printed in such large numbers, they are still plentiful today and thus, reasonably priced, usually at about $8 to $12 apiece. It's not unusual to find one in the original plastic sleeve in which they were originally packaged. Wheeldon's career began as a combat artist during the Second World War and eventually led to Hollywood, where he was employed by MGM and RKO as a staff artist and art director. He did portraits for the TV show, Queen for a Day and was art director at Los Angeles television station, KHJ. 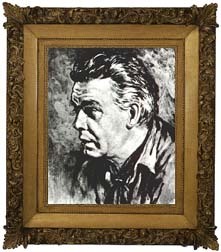 Respect for his work was so great, that some of the biggest names in entertainment, including Clark Gable, Kathryn Hepburn and Kirk Douglas, commissioned him to paint their portraits. Likely the proudest moment in Wheeldon's career, though, came when he was given a lifetime contract to paint the official portrait of the winner of each year's Academy Award for best actor and best actress. John Wheeldon died in 1993, at the age of eighty.